Fattening and aging, I think the fashion editor of Libelle magazine called the new skirt length for 1947... The New Look. I love the textured leaves/features woven into this fabric. And that vibrant colour of course. It has got a nice hand as well. It's cotton and fairly heavy but it isn't stiff like most heavier cottons are. Looking carefully, you will notice that this isn't such a complicated skirt at all. I had planned some flared and pleated affair but that would have 'restricted' me to a length of about 72 cm. This is 80. 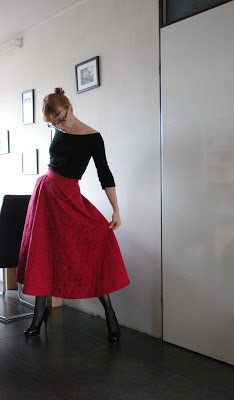 This is a simple half circle skirt with pockets which stick out from the hipline. In fact, I spend much longer on those than I usually do on a pocket arrangement. I had to figure out an angle which would make this work. Stick-out pockets are a common feature in skirts, dresses, coats and jackets from 1947 to well into the 1950's. 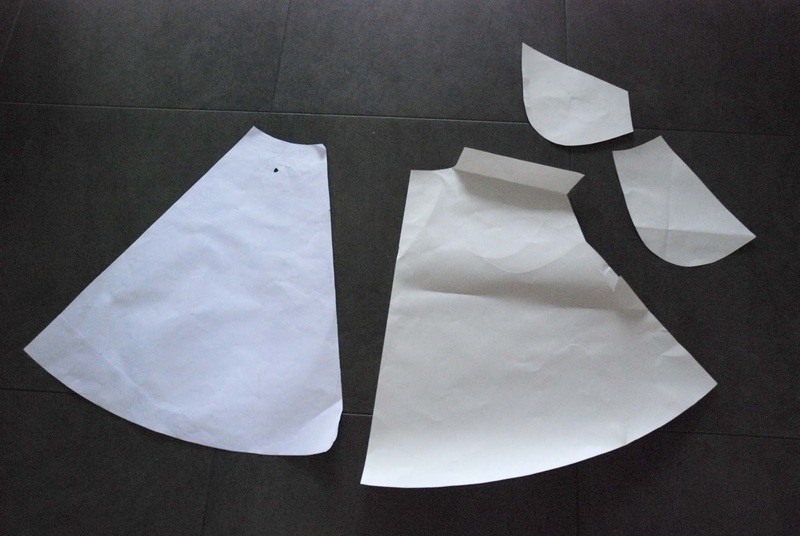 Back skirt, front skirt, pocket facing and underside of pocket. When sewing the side seam, you clip the seam allowance where the pocket angles away from the side of the skirt. Ok, I didn't mean to lecture. I feel very good in this skirt although its length may make it a bit impractical. I don't think it will be great for riding a bike for example. I'm going to trace that coat pattern now. I hope it will make for a nice coat to wear with this skirt. I have to say that this is neither fattening or ageing on you...exactly the opposite. You look fabulous! That looks amazing on you. I think that you are safe from looking older in this length. It works on you. Gorgeous look, in fact. I like your skirt and is very flattering on you! It is a lovely look, from front and back. And with those highheels you never look frumpish. That skirt looks amazing on you and I love it. Personally I'd love to see it in black as well. I think it would look lovely. I don't have much time to comment on blogs at this moment in my life but I must because, you look smashing! And I imagine that the length might be all right on your bike once you try it out. Doesn't matter, this is an all together winner!